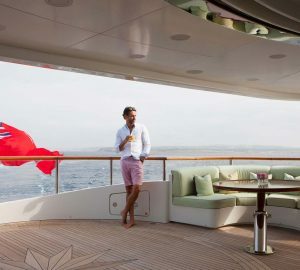 A Capri yacht charter vacation will often a part of an Amalfi Coast itinerary that might take in the famous surroundings sites of Naples and Pompeii, Ischia, Sorrento, Positano, Amalfi and the romantic clifftop town of Ravello. As an island that superyachts flock to, Capri is ideally suited to include as part of your luxury Italian yacht charter holiday. As guests approach Capri they will be enthralled by the dramatic coastline where white rocky cliffs hide amazing grottoes and dives sites. Kayak, paddle board or windsurf along the coast and admire the amazing coves and stacks such as I Faraglioni that characterise the coast. The Blue Grotto is one of three grottoes along the coast and the most famous for the blue lights at midday as the sunlight is reflected off the cave floor and onto the ceiling. Snorkelers and Scuba divers can experience this phenomenon for themselves, adding to the allure of the region. Writers and artists have historically also made Capri their home for extended periods, among which John Singer Sargent and Frank Hyde are particularly well known. Today, there are plenty of galleries where sightseers can purchase a painting or sculpture as a souvenir of their trip. 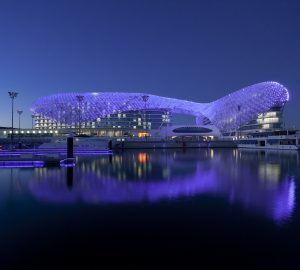 While enjoying all the advantages of nature, guests also have luxurious boutiques along Via Camerelle, fantastic tavernas and glittering nightclubs for 24-hour entertainment that can be accessed from the main port of Marina Grande. Whether touring the entirely of the Amalfi Coast or staying around just one location, Capri is an incredible destination that has something to amuse the various interests and age ranges present amongst your luxury yacht charter group. Historic hideout for the rich and famous, Lavish shopping, World-class restaurants, Sensational nightlife, Plenty of snorkelling and dive sites. The island has long attracted the rich and famous, including Emperor Tiberius who built a series of villas, of which Villa Jovis is one of the best preserved sites in Italy. Wear off your lunch and wander along Belvedere Tragara, which is lined with beautiful manors that lead up to a fantastic view point. Visitors with young children in the group can treat them to the amazing taste of Italian ice cream in one of the many gelaterias around Piazza Umberto I, and the hours will pass by while exploring the souvenir shops and museums among the labyrinthine streets lined with colourful Majolica tiles. Churches play an important role in the festivities on Capri, and they are open to the public year-round. In Anacapri, the San Michele church has an awe-inspiring Majolica tile floor depicting Paradise on Earth. For the best views from the summit, take the chairlift up to Monte Solaro and watch the sunset over Marina Grande. Romantics have a plethora of Michelin-starred restaurants to choose from, many of which have coastal views looking out over the Gulf of Naples such as Il Riccio along the road to Grotta Azzurra and L’Olivo, near the Monte Solaro. For greater privacy, escape to a bay where only the sights and sounds of nature will surround your luxury yacht. Depending on when you time your visit, you might experience one of the local festivals which are held throughout the year: Locals celebrate the cuisine and culture that makes Capri unique at Settembrata Anacaprese, and regattas, concerts and festivals are common throughout the summer months. In the summer months Capri enjoys an average high of 24°C/75°F while in winter the temperatures drop to 10°C/50°F, making it a year-round destination to enjoy the festivities and celebrations. November is the wettest month and June and July are the driest, adding to the popularity of luxury yacht charters to Capri during the summer months. For the summer months, loose layers of natural fibres are recommended, with guests covering up beachwear with smart-casual dress when entering the towns. The evening breeze can add to the chill factor so a light covering is recommended, and guests should keep a waterproof layer on hand in case of rain. 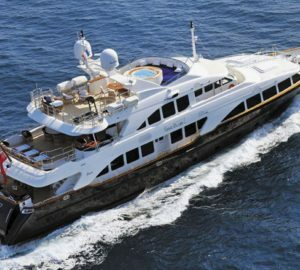 The tourism season on Capri is aligned with the luxury yacht charter season in the Western Mediterranean and therefore kicks off in May and continues through until the end of September. During this time, visitors can spectate numerous regattas as well as take part in local festivals that celebrate the island identity as well as mark holidays. If you are looking to have the island to yourself, the shoulder seasons ensure that your group has the warm weather and the majority of the services still at their peak availability. Yacht Rentals Available: Go here for the current list of yacht rentals in Capri. Full Italy Yacht Charter Guide: Go here for the essential Italy yacht charter guide. Itineraries: Here is a selection of broker itineraries for Italy. 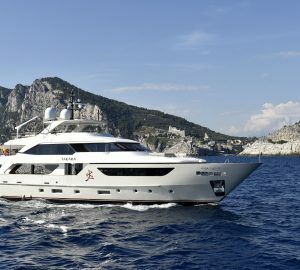 News: Read the latest superyacht news about Italy. There is a large selection of Capri charter yachts available, including motor yachts, sailing yachts, catamarans, luxury superyachts as well as spectacular mega yachts. 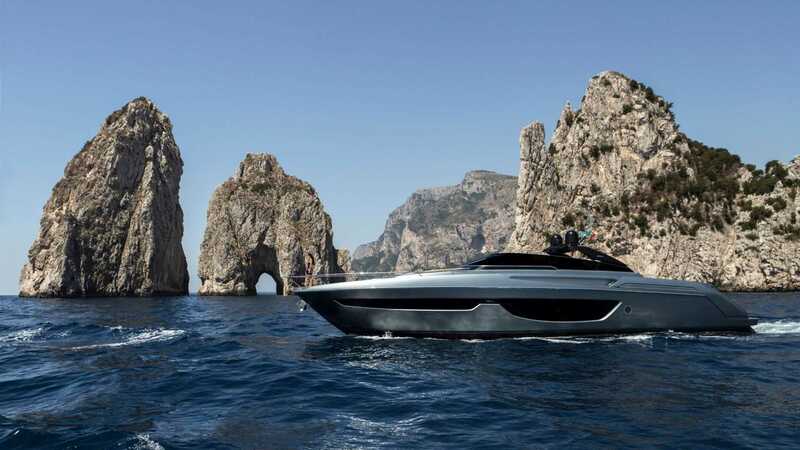 The island of Capri and the town by the same name attract superyacht charterers and luxury yacht owners the world over for the scenic white cliffs, charming Mediterranean towns and relaxed pace of life beside the sea shore. The port of Capri is the perfect place to dock while you sunbathe on the adjacent Cala Grande Beach, or head into town for some shopping in the exclusive boutiques. Sample Italian coffee at its finest and watch the world go be from one of the many cafes, then visit the cliff-top Gardens of Augustus, from which you can see the sharp turns of Via Krupp winding down the valley. The afternoon is the perfect time to escape on your luxury yacht and cruise to a sheltered anchorage. Here the group can spend the hours playing on the jet skis and water skis, swimming above colourful corals, or simply soaking in the sunshine on the sundeck sun loungers or in the Jacuzzi. The south eastern side of the island is particularly attractive and seen at its best only by boat: Sail through the pale blue water of Belvedere of Punta Cannone, visit the White Grotto or take out the kayaks and paddleboards to take in the coast at your own pace. Capri is excellent for cave diving and Scuba divers experienced in open water diving looking to increase their skills have Faraglioni, where the water reaches a maximum depth of 15m/49ft. Capri receives plenty of sunshine from May until the end of the summer Mediterranean charter season in late September, and temperatures rise from approximately 20°C/68°F to 24C/75°F before dipping in October. Sea temperatures climb in May from 18°C/64°F to 27°C/81°F in August, while the driest period is in June and July, when the sunlight hours are also at their peak of 10 each day.